With these fierce words, yelled at top volume by everyone present, hip-hop dancer and filmmaker Steven Nicholas Smith gets his 60 campers to wake up, look alive, and claim their artistic identities, every day of the Indigenous Pitch Summer Camp in New Orleans. And right there, the first free Indigenous Pitch New Orleans Summer Camp began. 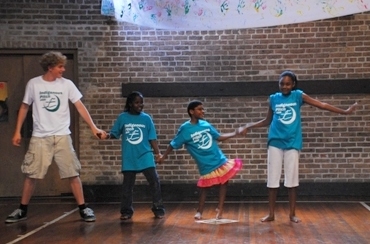 From July 28-August 10, 11 volunteer dancers traveled to New Orleans to teach more than 60 underprivileged kids, ages 6-18, the art of hip-hop, ballet, tap, breakin’, afro-modern, jazz funk and yoga…as well as classes in the visual and literary arts. Each day’s events had a theme such as Connections, Trust, Unity, Culture – that was explored in dance, art and writing. 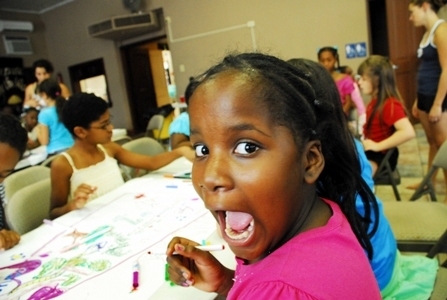 For New Orleans children in desperate need of involvement, expression, and plain old fun, the camp was a blessed release. For the Indigenous Pitch dancers & instructors, it was an eye- and heart-opening experience. Since that first camp in 2007, Indigenous Pitch has been back to hold camps in New Orleans every year, and evolved its mission to assist and nurture children affected by natural and socioeconomic disasters through dance & expression camps in North Philadelphia (2 camps a year), NOLA (6) and this July 4, one in Limbe, Haiti (assuming someone comes up with a plane to take them there – hint, hint.) Over 50% of their campers live below the poverty level and have virtually no access to the arts or dance — much less to pilates and yoga. Your title includes the words, “The Best Day of My Life”. These make me think of a customer that used to walk into my store and when asked “how are you” his standard answer was always, “It’s the best day of my life.” He told me those words meant so much to him that he had them tatooed on the iris of his eye! Sure enough as I stared into his pretty blue eye there were the words “Best Day”. I couldn’t hardly ever remember his real name because we all called him “Best Day”. It took me several years to finally realize that he had a glass eye! I wanna go dance with the kids too!!!! Thank you Betty, from all of us here IPDC! We really appreciate the donation and the story. It’s great!